Geocaching is like a giant international treasure hunt. You look up on the Groundspeak website for caches near you and then you set off and hunt them. Most (*but not all) are little boxes with trinkets that can be swapped and they are the ones that fit travel bugs too. 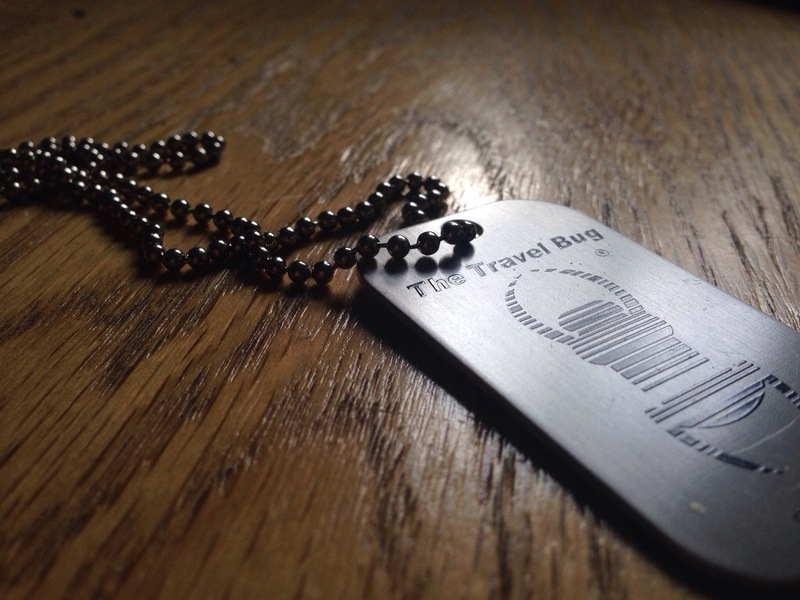 Travel bugs get moved from cache to cache by geocachers. They often have missions to get to particular places or clock up a certain amount of miles. Ours is going to race us on a similar path around America and Canada and then we will set an itinerary around Europe and wherever we go onto next. As we started in Cornwall we have brought it the first step ourselves to Wales. Its mission now is to get to London and then across to New York. From New York it needs to see as much of America as possible including Washington DC, the Great Smoky Mountains, New Orleans, at least one canyon (ideally the Grand Canyon, Bryce or Kings Canyon) the Rocky Mountains, Yellowstone National Park and somewhere along the west coast before heading onto Canada. It needs to work it’s way back across Canada and back to London in about a year. We’ll see who does it first! We’ve kept it simple just on a chain so it’s easy to get around and can fit in smaller caches. And so it reflects our “travel light” philosophy. Having dropped it in a cache just off the M4 in Wales we picked up a travel bug from the cache there. 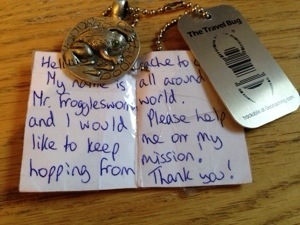 This bug is called Mr Frogglesworth and his mission is simply to travel as much and as far as possible. Specifically he wants to hop across the pond to America which is rather convenient seeing as that is exactly where we are heading in 10 days time! So we now have a little companion for the plane journey and we will aim to drop him in a cache somewhere outside New York City, probably in the Catskills. If you enjoy exploring and treasure hunting then I’d highly recommend a bit of geocaching, particularly with the kids. It’s great for motivation on circular walks or around towns and for learning a bit about history and geology of areas. *not all geocaches are boxes, some are tiny weeny and just contain a tiny roll of paper to log your find. Others again are simply places where you get a photograph to log your visit online. This entry was posted in Uncategorized on February 2, 2014 by Muma Dean. Hey Caitlin, it’s so great to see Mr Frogglesworth being well looked after :o) Your blog is pretty inspiring. I wish you all the best for your future adventures across the world. Sounds like you’re going to have a blast! I’ll be following your blog with interest and I’m looking forward to seeing where Mr Frogglesworth ends up! A very inspiring blog and it’s great to know that Mr Frogglesworth is going to be in safe hands for his hop across the big pond! Sounds like a brilliant idea! Love this, will have to have a look and see if we can one, my two would love it. Are you guaranteed to get yours back though, or do you start over with a new ‘bug’ each time?